When Rex, a German Shepherd, was first rescued from being chained up in a junkyard, the violent temperament instilled in him there seemed irreversible. After biting several shelter workers, it was determined that Rex be put down. 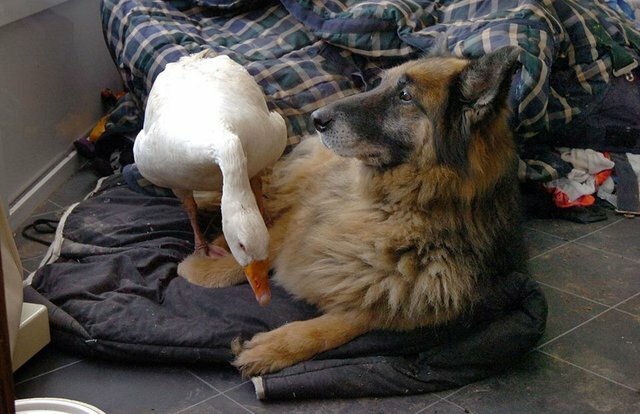 But that all changed recently when Rex made an unlikely first friend -- a rescued goose, named Geraldine. Staff at the Puriton Horse and Animal Rescue in Somerset, England, say that when the two animals met three months ago, they were worried that Rex aggressiveness might be triggered by the bird, but instead it was quelled. The pair, remarkably, have since become inseparable. "It's so comical to see them because they love each other to bits. She just runs around alongside him all day long and whenever we take him for a walk in the woods she has to come too," says Sheila Brislin, who works with Rex and Geraldine. "They are very affectionate and he's always licking her head and kissing her. She snuggles into him and they sleep together every night. Normally any bird that crossed his path would have been eaten by now, he's that kind of dog, but not Geraldine. I've been doing rescue work since 1997 and seen all kinds of strange animal behavior, but I've never seen anything like this."